Original printed screen by John Kay. 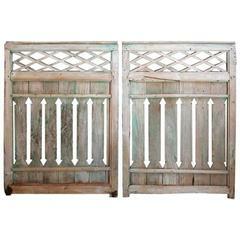 Each double panel is 40” W x 70” H. Each panel by itself is 20” W.
Pair of wood latticework and notched plank panels. Open criss-cross lattice above with arrow design below. Rustic construction unfinished, weathered wood. 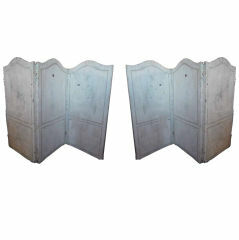 Pair of unusual three paneled crusty painted canvas screens. Rare process involving live specimens pressed into printing plates, circa 1855. Custom framing with conservation glass. Plate XLVII. Italian four-panel screen with bucolic transfer-painting by Enzo Strada from 1950s Every panel measures cm.37 x H 164. 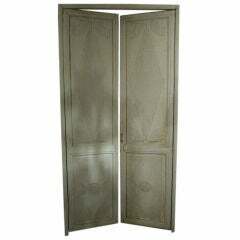 Metal and rattan screen or room divider from England. This lovely and delicately designed French carved walnut and gilt three-fold screen is circa 1890 and features the original bevelled glass panels on the top.